That’s probably a correct assumption but my point was that it’s ultimately just an assumption and there may be a lot of additional information made available to the court as the lawsuit progresses. We shall see =). so an attorney that’s making video on youtube to live, instead of practice law, is more competent than law firm that make money in courts like real lawyers. Do you really think that a law firm would take such a job knowing from the beginning they will surely lose? Its kinda uh, awful to accuse someone you dont know of being an incompetent lawyer because they stream in their free time. I guess it’s open season on anyone who doesnt harbor the same irrational level of hatred for a video game. In his initial video his analysis was more in favor of crytek as he thought it was more likely their claims would line up with the GLA, but after reading the actual GLA his predictions shifted, is it only now that he disagrees with you that he’s incompetent? Legal 101: there are many reasons to file a lawsuit, winning in an extended court battle is almost never the goal. More often the goal is to inflict annoyance and cost on the target with the goal of forcing a settlement (97% of lawsuits). It’s possible they underestimated croberts’ stubbornness, who would probably go for the moral win even if it’s less cost efficient. Intimidation from a “big bad successul firm” is part of the strategy when it comes to forcing settlements. We already know they aren’t infallible, since the filing and before this response they already had to amend their initial filing and remove a few of their claims including the “conflict of interest” thing some people were insisting was damning. The pool balls aren’t colored correctly, star marine is kill. is kinda awful to accuse someone to say things he has never said. what I would to point out is that his conclusions are surely not better than the ones written in the complain by Skadden lawyers. you seem to give a lot of credit to what he says only for the reason he says what you want to ear. Maybe he is right, maybe he is not. Like I said: we will see. What you said and what you meant might be different, fix your wording because right now according to you he’s on youtube instead of being a lawyer. I give him credit because i already was familiar with him before he made this couple of videos on SC, honestly the only lawyer i know who does these sort of breakdowns for video game relevant topics. He just won a case against a copyright troll that was terrorizing a few game devs. I also linked his initial video, which wasn’t favorable to CIG by any means, if you want a proper example of people posting those kind of links just because they agree with them lets say there are a lot better examples in this thread, actually thats all some people have been doing. Unfortunately i still have not seen any non-paywall links to the GLA and Motion to Dismiss filed by RSI/CIG. So right now i can not really form an insight based on source material in its entirety. But the snipplets/screenshots posted by theonewhoshouldnotbenamed on his Twitter feed give me enough material to say i do not think that the multiple accusations in the original complaint all stand on firm ground. I think D.S. 's interpretation is simply wrong in some key areas. E.g. the language allowing two separate named games to be made apears to support RSI’s side of the argument. I also did so far not see any clear clause prohibiting an Engine change. There are exit terms that will surely be discussed to death by both sides, but that is a different order of severity imho. One thing appears clear: As both sides demonstrate unwillingness to settle, this will drag out. The court will have to work though all the contract details, contract interpretations and the entire unknown-to-the-public communication between both sides in the dispute up until the lawsuit. There is one interesting tibit in D.S. 's tweet chain: If he is right, the maximum damage might be 1.8~ Million €. With CIG’s funds, that is something they could afford even if things go Cryteks way. I would take that number and interpretation with a huge pile of salt, but if it is correct, then the reason for CIG to fight this is most likely not the money itself, but the reputation loss of settling. Settling carries the message of “ok, we did something wrong”. As their entire funding system is 100% reputation based, they want to come out of this as a clear winner. Crytek probably would have taken a settlement many times over, to have cash on its hands now and not later when they might be dead. They basically sued cause RSI/CIG said NOPE to settlement. Ah, thanks! Always better to have source documents than some 3rd party oppinion pieces. The termination clause states that either party can only terminate the GLA if the other party breaches the contract or goes bancrupt. So the GLA should still be in effect to this day. Neither side has claimed that the GLA was terminated. No clause exists that requires CIG to keep using Cryengine. No clear provisions exist for engine switch either, but that just means you fall back to general law. Language what is and what is not part of the game strongly supports CIGs side of things. Damage claims seem to be very tightly limited by contract language. Wider law MIGHT override contract language, but no such argument was made by Crytek so far. This whole thing reads like a contract that is very favourable to CIG and Crytek is probably regretting a good part of it by now. But that is their loss, and nothing to hang CIG for. All the INTENTIONAL language in Crytek’s amendment come from the contract termination clause imho. Cause intentional breach of contract is one of the only 2 reasons for contract termination. But i still fail to see how contract termination would serve Crytek’s goal (get $€$ out of this). I am sure there is more to it than i as a non-lawyer can see. But from this, i see Crytek losing. I suspect Crytek is going for damages accrued after the contract is breached, which they would argue are necessarily not covered by the contract. That’s why you’ve got the copyright stuff there. I believe the real issue here is “discovery”. Is CIG willing to take this to court? Because if it does, it’s financials will come to light. Otherwise, they will need to settle. It doesn’t matter whether Crytek is in the right. Just because the court would possibly see their finances does not mean the public would. 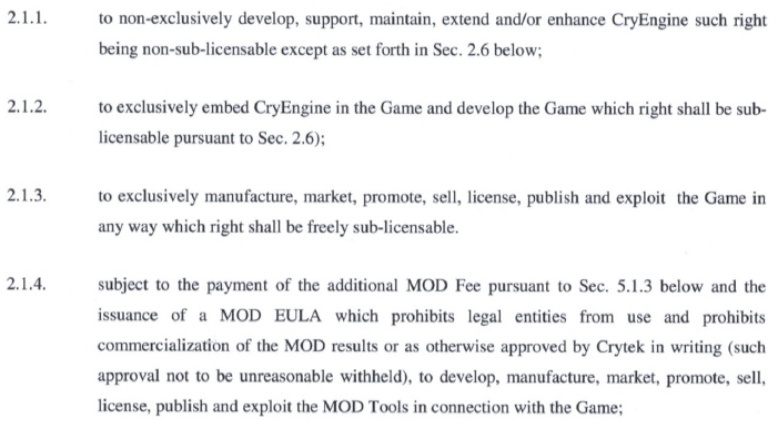 So from this, I would interpret that they have permission/rights/authorization to embed the Cryengine in their game (with restrictions) and are not necessarily “forced” to use it. As long as they don’t use two engines in their game simultaneously, then they would be exclusively using Cryengine. Though given Lumberyard is a fork of Cryengine, they could possibly have had Cryengine code still hanging around after they declared they had switched to Lumberyard. i.e. dual, non-exclusive engine usage. 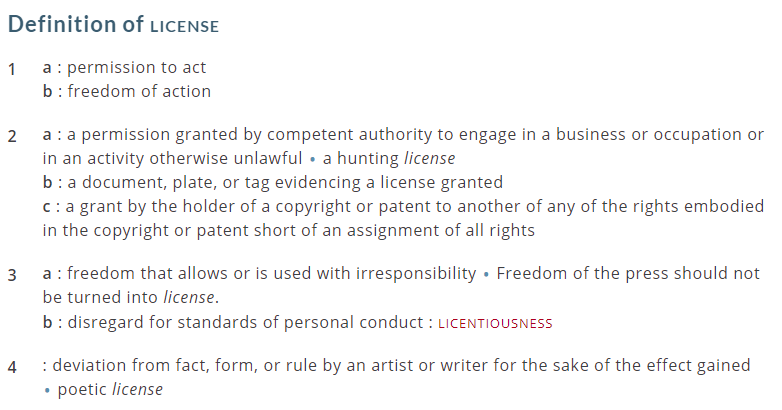 This part is a little sticky, but I would assume it to mean that they aren’t allowed to make a competing engine and market/license it (if we’re going to show you our code, we don’t want you making/marketing/licensing a competing engine during the license term)…but it only says they won’t engage in the “Business” of “licensing” any competing game engine, which could confer an exclusivity if business can be taken to mean they couldn’t also license an engine from someone else (for this particular “game” of course). I think that’s a weak argument though. not going to drop a large paragraph there. The rest of section 5 just discussed payment requirements, though they give very specific dates as to when several payments need to be made. If they didn’t make payments on time, I think that could potentially be considered a breach of contract, but I don’t recall seeing the court filing claiming they missed payment dates. I also didn’t see CIG filing any evidence of them exercising this option. I personally don’t think it’ll come down to the buyout, though. I think it will come down to when and if they fully changed to Lumberyard and maintaining exclusive use before/after announcing the switch and formally removing their logo. That may of course get sticky if Lumberyard still looks an awful lot like Cryengine under the hood. i.e. it’s hard to tell where one engine begins and the other ends. As for the copyright infringement, I don’t really know…I think it’ll still depend on timing of the above. I.e. they shared an engine with a non-valid 3rd party, but which engine did they really share? Somehow I completely missed 2.4 when I read it. That might have been the clause Crytek were arguing on, which might hold weight. I think a lot of the arguments will depend on how Amazon Lumberyard’s contract with Crytek is determined as well, common code may still belong to Crytek under similar terms to the GLA. It’s going to be an interesting fight if it makes it that far. I’m of the opinion that they have had 7 YEARS to create a stable foundation to build upon. At this point in time, I see a bunch of sparkley crap, but the foundation is abysmal. If you look at networking, physics, & combat, you will see that very little has been done to improve, or in my opinion overhall the entire game. The foundation is a cobbled together mess, and CIG intends to build a skyscraper on it. What if I told you you can play Star Citizen (squadron) 42(6) right now. I know, I saw it and couldn’t resist. As long as they don’t use two engines in their game simultaneously, then they would be exclusively using Cryengine. That depends on the license’s definition of “CryEngine”. If you could post that, it would help a bunch. That suggests to me that CryEngine is this thing “as offered by Crytek” and “as made available by Crytek”. If the CIG license is worded the same, then it wouldn’t matter if Lumberyard was source code identical - CIG is obliged to use the stuff they got from Crytek. The more I think about it, the more I think 2.4 is the potential noose around CIG’s neck. If CIG accept that Lumberyard is not Cryengine, then by developing on top of Lumberyard (a competing engine), they are probably breaching 2.4, unless they are doing/have done no engine work since the switch and plan not to do so for 2 years subsequent to that switch. Work done prior to the switch would count as work done on CryEngine, if we assume that CIG were sending compilable engine builds back upstream. If they weren’t that’s another breach anyway.